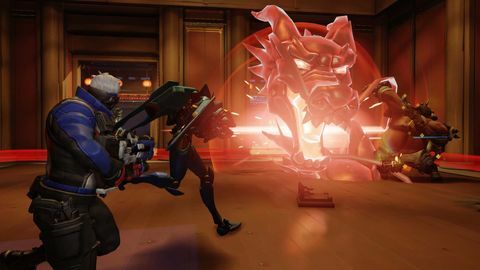 Toby gets a pre-release look at the Xbox One version of Overwatch. Blizzard’s long-awaited hero shooter has been in closed beta for a while now, and I think it’s fair to say every nook and cranny of Overwatch has been mostly uncovered. Anyone who’s remotely interested in the game is only a quick Google search away from being hit in the face with information from every possible angle, which certainly isn’t a bad thing. A lot of people are very excited for Overwatch and what it’s bringing to the multiplayer space. That said, while thousands of players have been traversing Overwatch’s world with their trusty keyboard and mouse, there’s also a console version that’s been hanging about in the dark while the PC version has been getting all the action. So, I ventured over to Blizzard HQ in Sydney to give the Xbox One version a test run. Having never played the game before, it served as a great introduction to the colourful world of Overwatch and the intricacies and fantasy at play in what could be Blizzard’s next big hit. Those who’ve played Overwatch won’t be surprised to learn that my time with the game was extremely positive. I instantly fell in love with what Blizzard has created, a expertly-seasoned mix of MOBA character abilities and first-person shooting mechanics. It’s different to anything I’ve played before, creating an experience that I just wanted to sink hours upon hours into. My hands-on session was two hours of trying out the game’s Assault mode, which, for those who have played Team Fortress 2, will feel quite familiar. There’s a defending and an attacking team, with the latter tasked with capturing a point and then escorting a vehicle to the defending team’s ‘goal’. It’s a simple game mode, certainly, but Overwatch’s selection of 21 varied characters keep things chaotic and unpredictable. No game was ever the same, and that made the experience constantly surprising. The 21 characters included at launch all wildly vary in abilities, movement, and difficulty. From melee-based characters to gunslingers, the choice and plethora of abilities make the game’s cast of characters unique, engaging, and fun to try out – even if a handful don’t suit your particular taste. Characters are also divided into four classes: Offence, Defence, Support, and Tank. Keeping tabs on these classes is important when structuring your team, as you’ll almost always need to keep a good balance to really challenge your opposition. In saying that, the character selection screen helps you out if you and your team are new to the game. If there are too many offensive heroes selected, for example, a pop up will let you know what classes you’re missing and what to fix to create a balanced team. You can ignore those tips, of course, but besides one game where our entire team chose Mei – a character with ice abilities worthy of challenging Mr Freeze – and ended up winning, running in with an unbalanced team will probably end in a loss. It didn’t take me too long to find a character that I was comfortable with, and I think my recent hours spent with Doom’s open beta pushed me towards the path of the rocket launcher-wielding Pharah, who turned out to be a fantastic character for a noob like me. 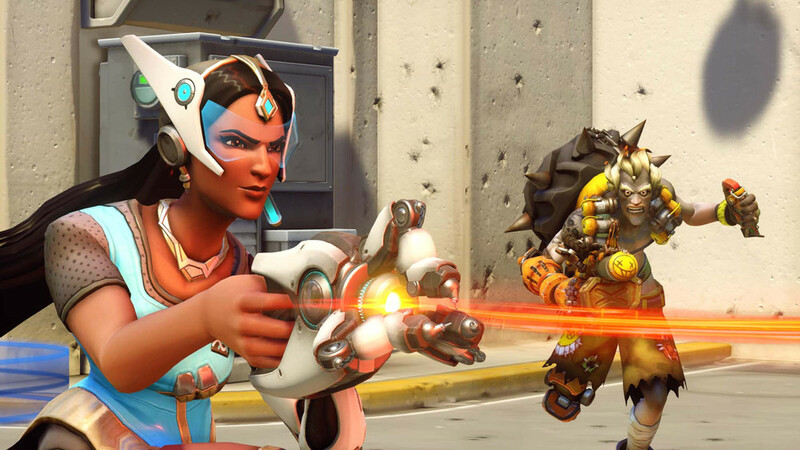 The large cast of characters available to choose from – and their differences in class, offensive strategies, and defensive strategies – means that almost anyone who picks up Overwatch will find someone they’ll like and are pretty good at using. It’s all about establishing a balance between having a character you’re comfortable with that also aids your team’s objective. Striking that balance not only makes Overwatch fun and enjoyable, it makes it damn addictive. 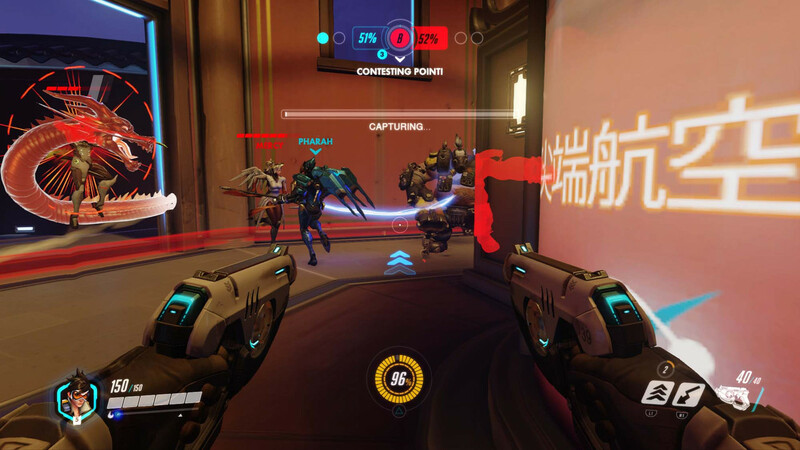 When the timer runs down and it’s time to play, Overwatch becomes more-or-less a hybrid of a MOBA and a first-person shooter. 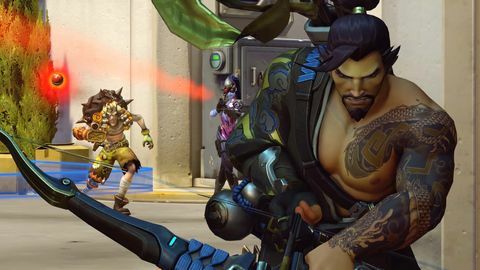 Blizzard has taken the abilities and ultimates seen in MOBAs and mixed them in with the traditional gameplay of a shooter, and it works brilliantly. Each character in the game has two special abilities unique to them, as well as an ultimate which charges during a game. Pharah's abilities range from a massive jump in the air (which usually disorientates enemies), a ranged projectile that’s handy for pushing enemies off objectives, and an ultimate that rains mini-rockets on groups of enemies – perfect for that clutch attacking or defending move (not that I ever managed to pull it off). When used properly, these abilities are really important, and that’s the same for every character that I played as and against in Overwatch. Making use of your abilities and ultimate is hugely important in winning a game and grabbing kills. Nothing feels formulaic or repetitive, as every match is almost always different to the one you’d just played. Overwatch plays really well on console and with a controller. There isn’t any noticeable lag, the game looks sharp, and the colours vibrant. One thing that did annoy me, though, was the aim assist. While it’s obvious why it needs to exist, there were a handful of times where I’d be shooting an enemy and my aim would track another player who’d just run by them. Most of the time I’d be in a 1v1 duel, and so the aim assist would almost always have me dead and buried. That was frustrating, but considering a controller can’t really replicate the snappy reflexes and precision of a mouse and keyboard, it’s just something that console players will probably have to deal with. Other than that, though, the game played great on Xbox One. All in all, I’m really keen to get into Overwatch when the open beta drops on May 5. Blizzard’s hero shooter is stacking up fantastically, and, if it delivers, should take the multiplayer space by storm on both PC and console. I’m excited to see what the future holds for the game, and how Blizzard will roll with it. And it's not even out yet.